Macro-Zyme Beneficial Bacteria | Valox Ltd.
Removes pond scum and odors: Eliminates fish wastes and ammonia. Digests organic compounds and assists in the breakdown of goose/duck excrement. Rapidly removes dead grass, leaves, and paper. Reduce Excess: Removes nutrients and sediments without chemicals. Decreases Nitrite and Nitrate, and reduces phosphate (which is typically the limiting nutrient for plant growth). Safe and Non Toxic: Non pathogenic/ non toxic to human, fi sh, wildlife, and livestock. It is safe for irrigation ponds and no permit is required. Better water clarity: Clears water and helps restore a healthy oxygen level while also reducing oxygen demand. Product extras: Dry pack means no extra weight when shipping. No “stinky” smells from the product itself. Easy to use: Simply toss in the water soluble bags, apply the bulk product, throw in the tablets, or place the block. Shelf life of at least two years. 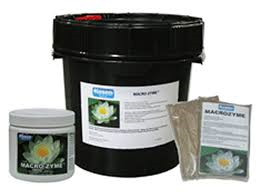 Pond treatment with Macro-Zyme™ is quick and easy. Once you have determined the total gallons of your pond, follow the label instructions for proper dosage depending on the Macro-Zyme™ size you have. If there is a UV Sterilizer in your watergarden, you will want to turn it off for at least 48 hours after the Macro-Zyme™ application. Macro-Zyme™ is a blend of facultative anaerobic bacteria and will work more effectively with the use of an aeration device.